Antoine-Joseph "Adolphe" Sax (6 November 1814 - c. 7 February 1894 was a Belgian musical instrument designer and musician who played the flute and clarinet, and is well known for having invented the saxophone. He also invented the saxotromba, saxhorn and saxtuba. Adolphe's first important invention was an improvement of the bass clarinet design, which he patented at the age of 24. Sax relocated permanently to Paris in 1841 and began working on a new set of instruments exhibited there in 1844. These were valved bugles, and although he had not invented the instrument it self, his examples were so much more successful than those of his rivals that they became known as saxhorns. They range in approximately seven different sizes, and paved the path to the creation of the flugelhorn. 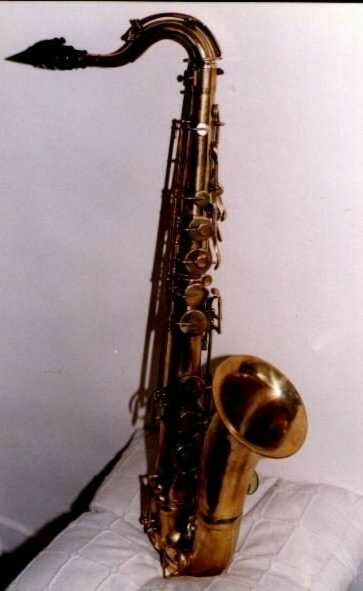 Today, saxhorns are sometimes used in concert bands and orchestras. The saxhorn also laid the groundwork for the modern euphonium. Fine French Saxophones Tenor By "Adolphe Sax"